VOA Special English - Should Family Play a Part in Immigration Policy? Should Family Play a Part in Immigration Policy? 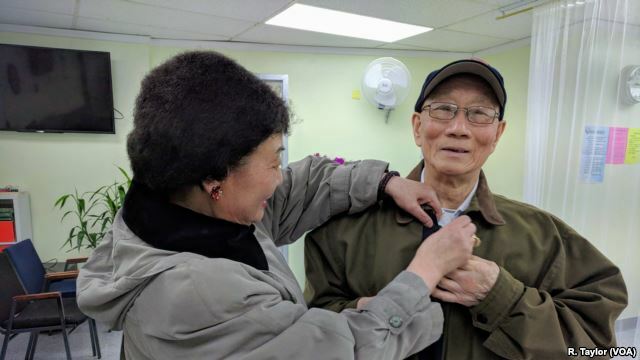 Every weekday, Xan-Xia Hong and her husband Ru-Liang Zhang visit the Chinese Community Center near their home in New York City. The two are retired and in their seventies. They moved to the United States 28 years ago. They entered the country through the family-immigrant visa system. They still remember how hard it was to get to the U.S.
Hong said, “For the journey, for our whole family, it cost us over 10,000 Chinese yuan.” That amounts to about $2,000 dollars in 1990. But that money did not guarantee much. “What were we to do if we couldn’t get the visa? We would lose everything,” Hong said. The two did not have dependable employment. A family member helped with financial support. They saved their money to pay for the nine-year visa application process for travel to the U.S.
During the following 10 years, Hong worked seven days a week in a clothing factory. Zhang worked similar hours in a restaurant for several years. Then, he inherited a small store. Their work ethic helped them put their three children through college. But, the two say they wonder if similar success might go unnoticed today because of President Donald Trump’s position on immigration. Their experience would be considered an example of so-called chain immigration. That is a term used by opponents of what is officially known as citizen-sponsored immigrant visas for family members. The administration says the system brings into the country people who do not add to the U.S. economy. Trump used the term on Twitter last September, “Chain migration cannot be allowed to be part of any legislation on Immigration!” The president has offered support for several pieces of legislation that would limit legal immigration. A merit-based system would rate immigrants based on their English-language ability, education level, employment offers and other things. Supporters say such action would lead to higher pay for American workers. Critics say the U.S. economy depends on low-skilled labor. Recent public opinion studies suggest that Americans do not agree on what to do to improve the immigration system. Justin Yu is a former reporter on immigration issues. He now runs the New York Chinese Community Center. He said family-based immigration is not a problem and is very important to U.S.-based families. Many Chinese immigrants share Yu’s opinions. They say that social programs and hard-earned rights are hurt by illegal immigration. Wellington Chen runs a local development company in New York called Chinatown Partnership. He said immigrants in his neighborhood mostly lead small businesses. Nicholas Louie is the 23-year-old grandson of Thomas Louie, an immigrant who was sponsored by his own grandfather 60 years ago. The extended family now includes a doctor, a college professor and a math teacher. Nicolas said he has a difficult time imagining what his life would be like had family immigration been restricted. Nicolas Louie said his own family is living the American dream. Ramon Taylor and Yuan Ye reported this story for VOA News. Mario Ritter adapted it for VOA Learning English. Caty Weaver was the editor.